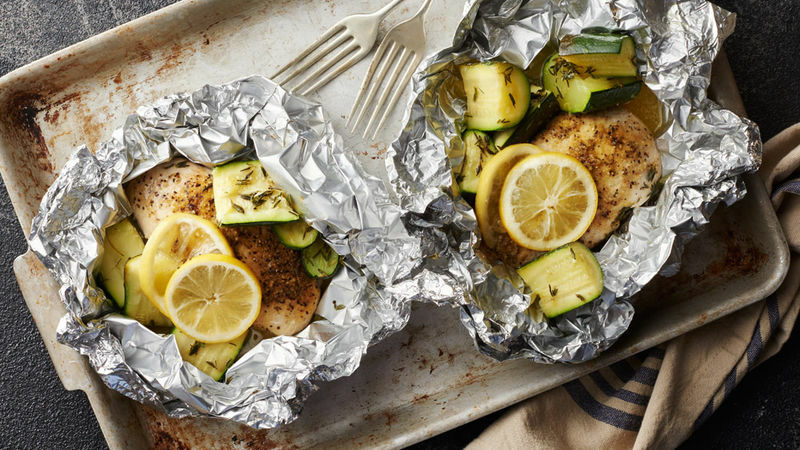 Who knew that a few sheets of foil are the secret to your next seriously delicious meal? One of the best parts of cooking food in foil packs is the versatility they provide. Pick a protein, your favorite vegetables and some seasonings and dinner is almost done. Or, if you’re craving something sweet, you can even make desserts in foil packs (case in point: our Banana Split Foil Packs!). Cooking spray is your friend. Be sure to spray your foil on the side that is touching your food. Which side is best? One side of aluminum foil is shiny, while the other is dull. You can use either side when cooking. Unless you’re using non-stick aluminum foil – then know that the non-stick coating is on the dull side. Be careful of steam. Carefully open one end of each foil pack first to allow steam to escape when cooking is complete. Then open the top of the foil pack and enjoy! If you’re cooking your foil packs in the oven, place them on a cookie sheet to catch any leakage. For a foil pack refresher, we’ve put together a comprehensive guide on How to Rock Foil Packs, so you can get the best results every time.